Mac OS X Tiger includes a feature called Automator that lets you program repetitive tasks — renaming a batch of files, say — without having to master programming. The Mac Automator is Apple’s way of automating or simplifying a computer practice known as scripts. To open Automator, open Finder, click Applications, and then double-click Automator. Automator is built around specific tasks, or actions (Open Images in Preview, for example), dragged from an Action list to a workflow area on the right side of the window. To help you get a workflow flowing, Automator (in Leopard) now lets you choose a starting point by clicking the icons displayed in the figure: Custom, Files & Folders, Music & Audio, Photos & Images, or Text. Suppose you select Music & Audio. From the pop-up menus, you can set up how audio is received by the workflow (from iTunes, from your Mac, from the Web) and how to proceed based on what you decided (for example, ask for songs and playlists now, ask for songs and playlists when my workflow runs). When you’re satisfied, click Choose. When you’ve dragged all the actions into the workflow area, click the Run button in the upper-right corner of the Automator window; each action is performed in a natural order with the results of one task flowing into the next one. Thus, various tasks must be performed in sequence and make sense working together. A single action can constitute a workflow. To take a simple example, you can automate the process of removing empty playlists in iTunes by dragging that action into the workflow space and clicking Run. 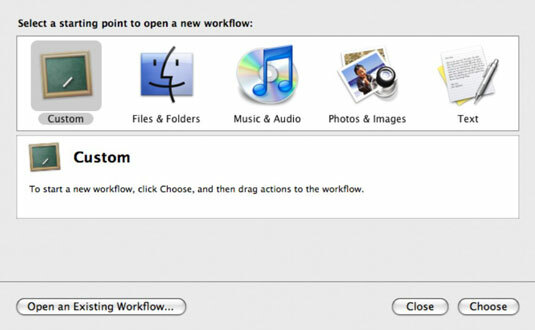 A Workflow Execution Completed message at the bottom-right corner of Automator signifies that the job is finished. Often multiple tasks make up a workflow. 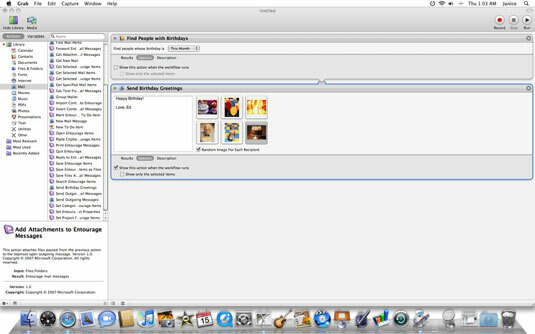 In this simple workflow, the computer will search the address book for people having a birthday this month and send an e-mail greeting (with picture) to those them. If you’re not sure about the steps that make up a workflow, click the record button at the upper-right corner of the screen to take advantage of a “Watch me do it” feature. You can save and reuse workflows by pressing Command+Shift+S. Third-party developers are creating workflow actions for their applications. You can check some of these out at Apple’s Web site.